Teaming up with BBH, Passion Pictures' Chris Curtis directs this latest spot for Audi, which uses dominoes to demonstrate that the car brand has seamlessly strung hundreds of innovations together to produce more fuel efficient vehicles. The Mill's CG team were involved from the early concept stage in order to create these thousands of dominoes in CG, as well as the car and road. Lead 3D artist Aidan Gibbons comments, "It was a pleasure working very closely with Chris Curtis from Passion Pictures and Art Director Tim Marrs. 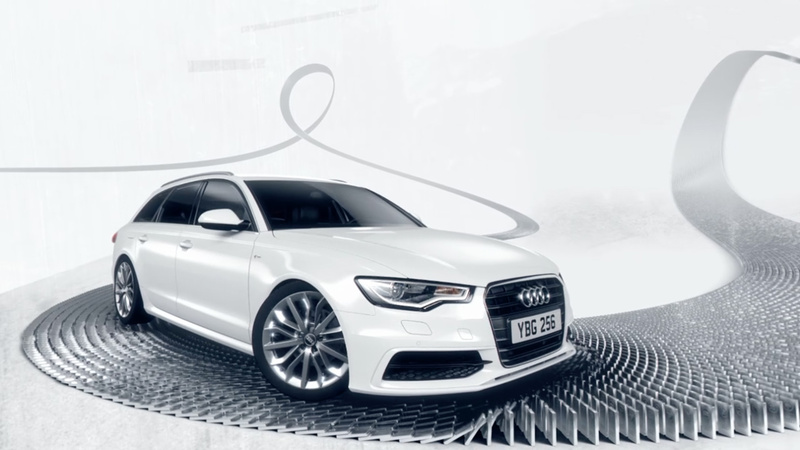 Using Softimage, Nuke and After Effects we managed to blend our 3D renders with the beautifully designed 2D icons, textures and design to create this surreal environment in which the Audi cars roam." VFX Producer Carl Phillips added, "This is an amazing example of a great team, a great client and a great brief coming together in super fast time to create a landmark Audi spot. We're incredibly proud of the final result!"